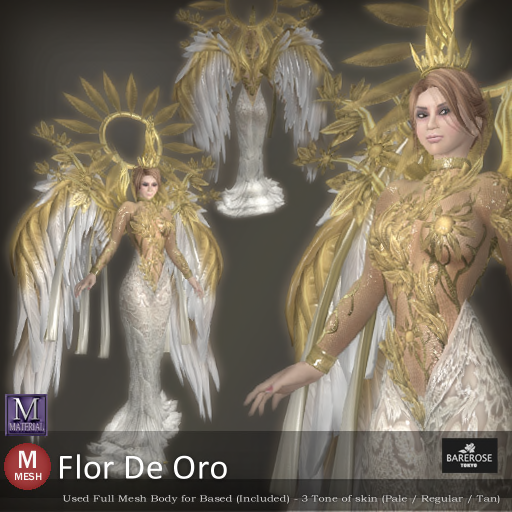 The Flor De Oro is a release in September in Bare Rose which is everything heavenly with nice laces like wings and lots of golden shiny ornaments. In fact, it would not be wrong to call this an angelic outfit. This is how dreamy and beautiful it looks on Kitty and it can too for you too! When put into the right light and mood, this outfit radiates an aura of serenity and vibrancy. Do you get the feeling you have been in heaven now? A close up of the outfit shows the golden plated sun and vines patterns over a transparent body suit for the top and impressive feathers and laces around the large angelic wings. And who can miss the huge sunshine halo which bright light and laughter even in the darkest of times.